I used the "girly" half of the Denyse Schmidt collection Picnic and Fairgrounds. I added in some more neutrals and solids and ended up with a VERY different color palette for me. I always find my tastes warring between a softer vintage look, and a bright modern look. But I can be both, right?! It's more fun that way! And some Bliss Flannel on the back. Nothing like some cozy flannel to finish off a baby quilt. What a cute quilt! The DS fabric works perfectly for baskets. 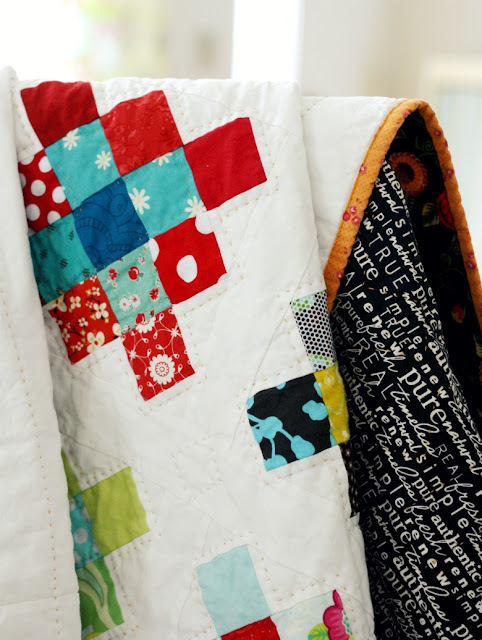 I love your use of DS in this quilt! It is gorgeous! You can most definitely be both! This is lovely!! I love your baskets - so far I've only done traditional basket blocks but I want to have a go at these liberated ones! Oh my goodness that is so cute! It really has a vintage feel to it. Very cool! Like this one even more that the first! I loved this Quilt!! :) Its so cute! My mom loves to make Quilts, but she stitches them by hand! I love this, Jo. Your creativity is amazing! Wow, this is so creative. The combination of the soft pink, yellow and aqua and the bold blue, red and turquoise is so unsual. And it totally, totally works. Well done (again)!!! It is LOVELY!!! I like the softness of this ... your style is beautiful! Wow, this color palette is gorgeous! I think you most certainly can be both. It's gorgeous! I have the book on my christmas list but I'm not sure i can wait that long. really cute. it can be fun to mix the soft and bright all together. This is really a sweet quilt....love the pale, soft colors! Love this quilt. I just receive the book yesterday and look forward to making this quilt. Would you mind sharing who makes the blue/white stripe fabric. It really works well in this quilt. Thanks so much! I've been staring at this quilt all night and decided to start making baskets. They're addicting! I have made about 6 tonight. Thanks for the inspiration. I have to make a similar quilt now because I have been wanting a basket quilt and yours are so dang adorable. Great job! Oh and I'm following you now. You do great work! I really love this! I must be out of the quilting loop because this is the first I'm seeing of these baskets. Great job! Any chance you can explain how you made the handles so lovely? Jolene, I just wanted you to know that this quilt inspired me to make a table runner for my mother-in-law. I've been wanting to make a baskets quilt for a long time ever since I got Gwen Marsten's book. You can see my table runner here: http://veronicamade.wordpress.com/2012/12/28/a-handmade-christmas/ Thanks for the inspiration! All I can do is smile when I see your basket quilts. :-) :-) :-) Thanks from here to the moon & back.